A microbe that mediates carbon and metal cycling in stratified marine and freshwater environments and serves as a model microbe for systems biology research is highlighted in a review article in Nature Reviews Microbiology. "Towards environmental systems biology of Shewanella" appeared as one of a specially commissioned set of articles highlighting the importance of microorganisms in climatic processes and research on the generation of new energy sources. Shewanella oneidensis MR-1 came into the spotlight in 1988 with an article in Science describing its notable properties as a dissimilatory metal-reducing; that is, manganese-breathing, bacterium. These include its ability to transfer electrons to solid metal oxides and its anaerobic versatility. But what heightened interest the most within the environmental sciences community was the discovery of Shewanella's ability to reduce metal and radionuclide contaminants such as uranium, chromium, iodate, technetium, neptunium, plutonium, selenite and others. These diverse capabilities have promoted the development of Shewanella as a model organism for systems biology and for investigating fundamental mechanisms of electron transfer to minerals and to soluble metal ions. Enter the Shewanella Federation, a DOE-sponsored consortium of scientists across the nation working collaboratively to understand how S. oneidensis senses and responds to its environment. 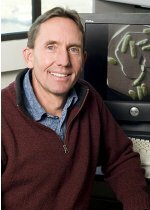 Jim Fredrickson, a microbiologist at Pacific Northwest National Laboratory is lead author of the review article. Fredrickson has been Shewanella Federation lead at PNNL since 2000. Senior author is Jim Tiedje, Michigan State University and a member of the National Academy of Sciences. Co-authors are Margie Romine, Alex Beliaev, and Grigoriy Pinchuk, PNNL; Jennifer Auchtung, MSU; Michael Driscoll and Tim Gardner, Amyris Biotechnologies; Ken Nealson, University of Southern California; Andrei Osterman and Dmitry Rodionov, the Burnham Institute; Jennifer Reed, University of Wisconsin-Madison; Jorge Rodrigues, University of Texas; Daad Saffarini, University of Wisconsin-Milwaukee; Margrethe Serres, Woods Hole Marine Biological Laboratory; Alfred Spormann, Stanford University; and Igor Zhulin, Oak Ridge National Laboratory. The authors have been supported by the U.S. Department of Energy's Office of Biological and Environmental Research through the Shewanella Federation consortium and by the National Science Foundation. References: Fredrickson JK, MF Romine, AS Beliaev, JM Auchutung, ME Driscoll, TS Gardner, KH Nealson, AL Osterman, GE Pinchuk, JL Reed, D Rodionov, JLM Rodrigues, D Saffarini, MH Serres, AM Spormann, IB Zhulin, and JM Tiedje. 2008. "Towards environmental systems biology of Shewanella." Nature Reviews Microbiology 6(8):592-603. Myers C and K Nealson. 1988. "Bacterial manganese reduction and growth with manganese oxide as the sole electron acceptor." Science 240, 1319-1321.